This issue is edited by two women with New Zealand links. Joan Fleming is a poet currently writing a doctorate on ethnopoetics at Monash University. Her second poetry collection, Failed Love Poems, has just been released by Victoria University Press. Anna Jaquiery is a Wellington based novelist. Pam Macmillan (UK) have published two of her crime novels. She is also completing a doctorate at Monash University in Creative Writing. This issue contains poems and short fiction, and includes a number of writers with New Zealand connections (including Emma Barnes, Amy Brown, Lynn Davidson, Rosa McGregor, Lee Posna, Erin Scudder, Steven Toussaint, Sugar Magnolia Wilson). Joan has written a terrific introduction that sent me down trails of sparking thought in view of my new project on NZ women’s poetry. She introduces the life-blood theme of the issue: errance (‘1. the act of travelling from one place to another without any clear destination 2. a wandering of the mind’). Such a poetic prompt stands in for the way many writers work. Yes, there is a starting point but you then let go into uncertainty, discovery, uncertainty, electricity. Joan writes: ‘What we know and can’t know is a personal obsession of mine. I try and practice a mode of attuned, sensitive ignorance in my own poetry, as well as in my research.’ The word ‘can’t’ — a tiny hook as though taboo or impenetrable or withheld. 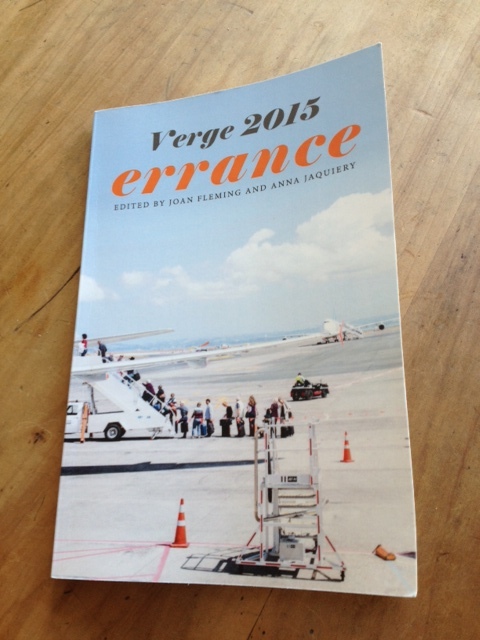 ‘Errance’ also stood for the way I engaged with the issue as reader. In a sense (aural, visual), the work is afterness (Post Language) in that it steps out of Language Poetry. A thin, almost invisible guy rope. You enter into murkiness, the unfamiliar, difficulty, miniature theatrical stages, staged heart, aural agility, sumptuous image building, dissolution, elusive meaning, skerricks of story, smidgeons of character, semantic hinges. Aural chords. Visual melodies. Sharps and flats for ear and eye. What binds this collection of writing is an utterly infectious joy of language. A love of the word on the page — of the way this word electrifies that word. Or mutes. Or sidetracks. I loved the metonymic kick between this word and that word, this presence and that absence, this gesture and that arrival. Always poetic currency fermenting in the gaps. Cody-Rose Clevidence (I can’t reproduce the title correctly as the first word is crossed out) but the poem is from ‘Flung Throne.’ The looping, loping syntax brings you back to the word, then steers you to a pulsing visual tapestry. Hairs raising on the back of my arm as I read this. Lee Posna ‘Job’s Clouds’ The poem takes ‘cloud’ as its poetic core and then surprises you at every twist and turn. The last line catches you, utterly. Steven Toussaint from ‘Aevum Measures’ Reading this for me is a Zen-like experience where I get drawn into the moment of a line ( a word, a phrase) and everything stalls. The language — resplendent for the eye, divine notes for the ear. Poetry then becomes transcendental. Uplifting. Leads you elsewhere. Beyond this, for me, the surprising metonymic glints are a vital feature. Cy Mathews ‘Old Song’ This is like a road poem, a skinny road poem (part fable) spining down the page where nothing much happens, like that view that is always the same, never shifting, until you spend time and learn to look and there you are nestled in its alluring grip and difference. Shari Kocher ‘Errancy: A Primer, after Emily Dickinson’ Poems split in two halves with an empty backbone that makes reading variable. You move through honeyed melody and crackling connections. Over that split between left and right. Up down. I acquired a compendium of phrases I want to keep with me for awhile. Reading this issue it felt as though there is something in the air we are breathing. A poetry mist/spray that gets into our lungs. Motifs echo. Poetry here invites a different way of reading, yet never lets go of eye and ear. And still, in the very best examples, you meet that drumming heart. In the white space, the cracks, the cloudy patches, in the inbetween. If all the issues have this vitality, and take you to a verge in such distinctive ways, it is worth a subscription. Bravo! This entry was posted in NZ author, NZ poetry and tagged Anna Jaquiery, Cody-Rose Clevidence, cy mathews, Joan Fleming, Lee Posna, shari kocher, Steven Toussaint, verge on September 8, 2015 by Paula Green.